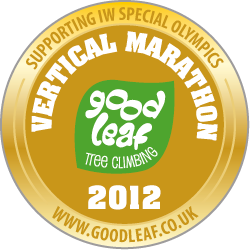 What on earth is a Goodleaf Vertical Marathon?! 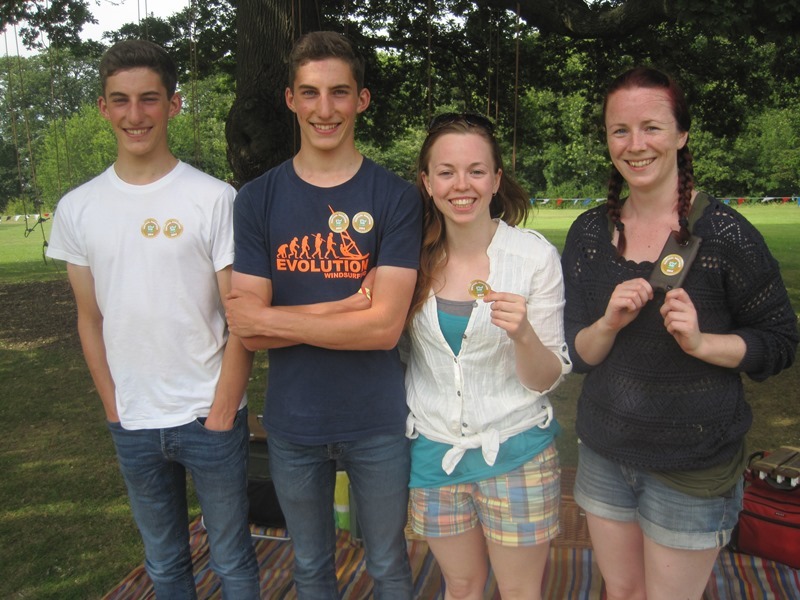 …in 2012 we thought it would be fun to host our own Olympic event and give our climbers the chance to win Bronze, Silver or Gold or even the highly coveted Green Goodleaf medal. We thought we could maybe raise a little cash for a local good cause by asking everyone to make a small donation to join in. It’s a simple way of giving back to our local community. ‘Medals’ (stickers) are awarded in relation to how far you’ve climbed. 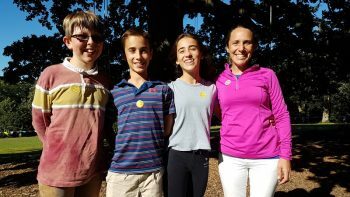 We add up the distance that each individual has climbed over our tree climbing season when we close and we hope that together we can climb the distance of the marathon! That’s 42.195 km or 26 miles & 385 yards fact fans. 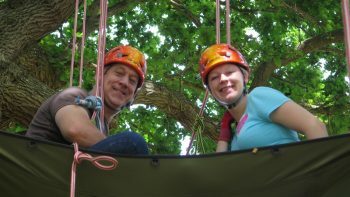 It’s not an exact science but it’s loads of fun and a great way to challenge yourself – so get your tree climbing gear on – it could be you on the podium/branch this year! In 2019 we’re delighted to be working with Planet Aware a local organisation who are committed to helping people and organisations make smarter choices about the way they use the earth’s resources. We like to keep things very local at Goodleaf, so together with Planet Aware we’re going to be raising funds to buy 2 Minute Beach Clean boards for Ryde Beach. 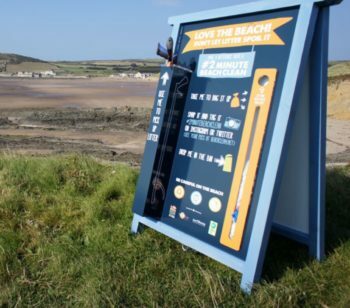 The idea of the 2 Minute Beach Clean board is simple: to make it easier for everyone to help keep their coasts free of marine litter. The board has all the information, litter pickers and bags that you need to do your own mini clean-up when you’re one the beach. Planet Aware are working with other local organisations who will become guardians of the boards, putting them out each day and generally keeping an eye on them. We’re really hoping that by the end of the season we can collect enough for three boards…as well as climb over a marathon! 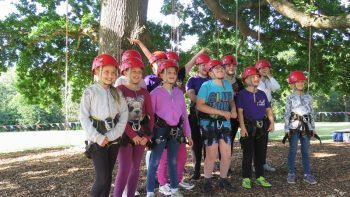 In 2018 we raised over for Oakfield CE Primary School which is situated at the top of the lane that runs through Appley Park. Oakfield has fantastic grounds, which once included Appley Park and were landscaped by Humphry Repton in the 18th century. We’re delighted to announce that we raised £929.32 for the school’s new sensory and kitchen garden and climbed a whopping 44.95 km in the process, easily beating the distance of a marathon. The school is situated in an area of high deprivation and the garden will also provide a prayer garden as space for reflection and contemplation to enhance the well-being of children and their families. It’s been another bumper year for the Goodleaf Vertical Marathon – our tree climbers climbed the distance of 43,426 km. Well done everyone! An extra massive pat on the back for everyone this year – for the past four years we’ve added up tree climber’s and instructor’s climbing distances together to reach the marathon, but (drum roll! ), but in 2017 we’ve reached the distance just on tree climber’s climbs alone. Fantastic! Even better, we raised over £800 for the Wight Squirrel Project a local charity who work to protect the Isle of Wight’s population of Red Squirrels (we only have red ones on the Island). We’ve got a soft spot for these squirrels and you can often see them in Appley Park if you’re quick enough. The project is run entirely by volunteers who monitor squirrel numbers, care for injured squirrels and also complete important research about the squirrels. Wowsers – we nailed it in 2016! Together we climbed a total of 55,608 metres – that’s over 55 KM! We took a lot more school groups climbing in 2016 and it shows in the number of metres we climbed. Thanks kids! We also raised £685.07 for Ryde Inshore Rescue – it was an absolute pleasure to be able to support the hard work the volunteers do. We gave out 405 Gold medals, 310 Silver medals, 759 Bronze medals and 563 Green medals over the year – amazing. Congratulations tree climbers – you climbed an amazing 40, 613.5 metres – that’s nearly a marathon in itself! Add on Paul’s climbs and it comes to 44.783 kms, way past a marathon. It’s not quite as many km as 2014, but we can blame the rain in August for that! It’s still an excellent result, so a big thank you from us. We raised a whopping £623.39 which we donated to Friends of Appley along with a donation of £110 from our Big Tree Party in May 2015. So in total donated we’ve raised £733.39, which Friends of Appley will use to install something in the park for our four legged friends. More info on that coming soon. As well as metres climbed and pounds collected, we gave out 429 Gold Medals, 293 Silver medals, 572 Bronze medals and 568 Green medals. Wow! Gift to Nature have kindly decided to spend our donations on something for Appley Park our seaside location. Watch this space for more details. In 2015 we are collecting for Friends of Appley, a local charitable group that support the park and beach areas. Another superb result; £683 raised but alas no marathon reached – we’re edging our way there on 38.25 km. In 2013 we raised money for the Isle of Wight Christmas Toy Appeal. They collect and purchase new presents for children and young people on the Isle of Wight who would otherwise be going without a present. It was very special to know that there was something special under the Christmas tree for those children. A massive thank you to everyone. We raised over £650 for Special Olympics Isle of Wight with the Goodleaf Vertical Marathon. This covered all the costs for one Isle of Wight athlete to attend the 2013 Summer Games in Bath. It’s definitely a gold medal result! We didn’t quite climb a marathon, but we managed a grand total of 33.01 km over the whole of 2012. We awarded 1082 medals including over 400 Gold medals. 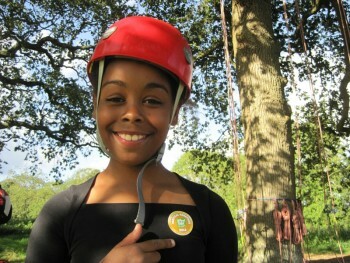 It’s an excellent result and we’re amazed at the amount of climbing that goes on in our trees. A special mention must go to Samuel who has climbed with us on a number of occasions – he climbed over 100m in one two hour session and will be awarded a Goodleaf Cup of Honour.